the Secretary of State for their business license "Late night dance club with live band or DJ playing popular music" makes the establishment sound more club than restaurant. The restaurant is scheduled to open by May 1st and Washington tells me that he will offer the first 100 patrons a free "tapas meal" which he explained to be a small sampling of his menu. The restaurant will feature both BBQ and southern favorites like collard greens, sweet potato souffle and cornbread. Washington claims his atmosphere will be on par with Fatt Matt's, a pretty serious claim considering Acclaimed director Jason Reitman loved Fatt Matt's enough that he plugged the restaurant in his 2009 film "Up in The Air." In the film which stars George Clooney and Vera Farmiga, Fatt Matt's is touted as the best BBQ in Atlanta. Not far away on Collier Road, Billy Jack's BBQ & Shrimp Co. closed last June, about nine months after opening. I stopped in once and while the food was good, it was not fantastic by any means, and the location was difficult to find with limited signage and zero visibility from Howell Mill. Billy Jacks's reportedly had a food truck "The Barbecue Source" in the works, though I have yet to see it. Strangely, they do still park their branded box truck on Pharr Road but I'm not sure if there is another location or concept in the works. Washington has secured a six month lease for his new BBQ concept, so off the bat, Billy Jack's will have lasted longer. The reason for the short lease is that the property's owner Healey Weatherholtz plans to re-develop the entire block within the next year or so. The plan is for restaurants, boutiques and residential units. The restaurant's main entree items will be priced around seven bucks which is pretty fair and reasonable but when Washinton told me he was going to offer valet only, I was a little perplexed. Not far down Howell Mill, FLIP Burger Boutique, a higher end concept with more expensive menu items and a similar parking situation offers self parking. At both restaurants there is limited up-front parking but both restaurants have developed relationships with nearby businesses to utilize additional parking during their off-peak hours. I'm not gonna call this another Chow Baby-esque scenario but Carizma definitely has some of the same troublesome characteristics. With luck, Washington does well enough in his six month trial run that he is able to secure another site elsewhere as I doubt he will be involved in the re-development. What do you think of this odd concept? Will you patronize a BBQ / lounge? Are you excited about the upcoming redeveopment and nearby Atlanta Food Truck Park & Market? Please share your thoughts in the comment section below. The definition of "best" barbeque is one of the most subjective topics, along with pizza (as commentary has proven recently). Case in point, This Is It! apparently won BEST BBQ in the nation via the Hoodie Awards. Either way, I don't personally see myself frequenting a BBQ Lounge, seem a very odd juxtaposition. So nice for this shopkeep to advertise the pending arrival of Community Q to the area. Lets see how long this lasts... that space has been so many things over the last few years. I have recently talked to Robert Washington over the phone. He has not surrounded himself with competent employees and is very conceited. 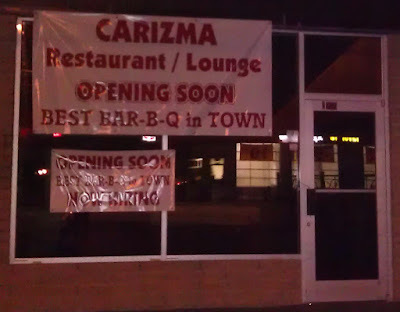 I can't imagine this restaurant lasting more than 6 months.